It’s nice to be able to rave at full throttle when describing shows at the Performing Arts Center and Saturday’s reprise of the “Three Mo’ Tenors” may well exhaust the superlative keys on the word processor. While the concept of this musical review was originally conceived to play off of the Original ‘Three Tenors’ of Opera this show has taken on a life of its own. No Pavarotti, Domingo and Carreras are here but Phumizile Sojola, Duane A. Moody and James N. Berger Jr. are more than capable of hitting the high notes and are far more versatile than the Italian superstars. This is a meticulously rehearsed and perfectly performed evening of eclectic song drawn from the rich vault of Popular and Classical music, particularly from the grand African-American influence on the American musical culture. This time through, the arias were only used as an appetizer but the main course was delicious visually, spiritually and especially acoustically. Each artist excels in certain areas but all stood even on a stage that emphasized the songs and not the setting. 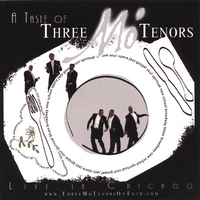 A jocular “La Donna E Mobile” provided a link to the Three Tenors but the Three Mo’ Tenors took it with tongue in cheek and tossed in showmanship that continued throughout. “Recondita Armonia” from Tosca and “De Miei Bollenti Spiriti” from La Traviata pretty much concluded the grand opera portion but each were done quite professionally with vocal power up to any tenor on the Operatic stage. Samuel Barber’s challenging “I Hear an Army” was a revelation with an edge as done by James N. Berger. The remainder of the show drew from a deep well of song, covering traditions are varied as Rhythm and Blues, Broadway musicals, Jazz, Blues, Soul, Spirituals, Gospel and even a delightful chunk of Hip Hop. The performances were so good you could take slices from any portion and build an impressive show just from that genre.